“Living wage” is the usual English translation of the Spanish term “salario digno.” But much more than the bare bones connotation of paychecks sufficient to sustain life it connotes a “wage with dignity” wherein labor rights are recognized, skills are acquired, and workers are valued partners in the productive process. In this sense, a living wage is remuneration that treats workers as human beings with dreams of improving their lives, not merely as disposable slaves to the profit machine. In apparel factories the opposite of a living wage has been the norm since the industrial revolution. Profits are sucked from the sweat of workers paid subpoverty pittances for long hours of manufacturing products under inhumane and often hazardous conditions, denied the right to complain let alone organize a union. At the very least, workers are likely to be deprived of bathroom breaks, suffer from oppressive heat and poor ventilation at the job site, lose pay for production line failures and are fired if pregnant and so forth, while major workplace tragedies still make headlines with depressing regularity. For example, in 1911, 146 women workers lost their lives in New York City’s Triangle Shirtwaist factory just because of the lack of fire exits. And despite labor protection gains in the United States, such occurrences are on the increase today with the shift of apparel production to countries of the global South with lower wages and looser labor laws as the 2012 Dhaka, Bangladesh Factory fire which killed and injured over 400 workers attests. In other words, under globalization we are looking at a resurgence of sweatshops under the constant cutthroat pressure to lower production costs despite the human toll. It does not have to be this way, say worker rights advocate Sarah Adler-Milstein and international relations and business ethics professor John M. Klein in Sewing Hope: How One Factory Challenges the Apparel Industry’s Sweatshops, a case study of the Alta Gracia anti-sweatshop factory in the Dominican Republic. Adler-Milstein and Klein show how the Alta Gracia business model since the factory opened in 2010 has evolved into a viable, sustainable and above all humane and dignified alternative to the industry race-to-the-bottom standard. Sewing Hope aims to spread the word about why the Alta Gracia model can and should become the new apparel industry standard. The authors do this through a fieldwork-based chronological organizational ethnography, heavily dependent on site visits and revealing interviews with key stakeholders including both management and workers about the life-transforming experiences they have shared. This cast of characters is vividly portrayed in their own words accompanied by often charming photographs which bring both their tales and individual personalities to life. The first chapter sets Alta Gracia in the broader context of the global apparel industry in terms of the huge challenge it is making to global sweatshop norms and the economic thinking that justifies the perpetuation of labor exploitation. The second chapter takes us back to the previous occupant of the facility now occupied by Alta Gracia in the sprawling free trade zone outside Santa Domingo, a hat factory producing for big brands and for universities in the United States, and its workers’ attempts to organize. Chapter 3 tells how a corporate CEO with a conscience and a labor organization executive reached a landmark agreement to create an anti-sweatshop, a living-wage apparel factory predicated on labor rights and social justice principles. Chapter 4 chronicles the early days of Alta Gracia when ideals were translated into action as the former hat factory facilities were renovated and many of its former workers were hired in a model approach to fair hiring in an industry rife with abuses. The next chapter is critical in showing the importance of flexibility in transcending the usual workplace scripted management versus labor roles as everyone involved in the new venture had to step out of their comfort zones and take on totally new functions in bargaining for the best economic interests of the collective. The following chapter conveys the heart and soul of Alta Gracia’s bold challenge to the industry status quo through workers’ personal stories of how participating in this collaborative enterprise has made it possible to realize their dreams. Health insurance allows a worker to have uterine cancer surgery and eventually study to become a medical technician. Another worker’s family starts a small business. A third proudly pays commuting costs so that her daughter can represent the country on the national basketball team. Others fix up their houses, send their children to better schools or pay for their higher education. Still others become persuasive labor organizers and advocates. The last substantive chapter examines the Hanes Corporation acquisition of Alta Gracia’s parent company, Knights Apparel, and the additional challenges presented by the ensuing restructuring even though the Dominican factory was not included in the 2015 deal. Pivotal in the survival of the fledgling startup was the former Knights Apparel president becoming Alta Garcia’s CEO and eventual sole shareholder personally committed to making a revised business plan achieve narrow profitability in the near future. The last chapter considers what it might take for the Alta Garcia approach to be replicable elsewhere. A short afterword reflects on what stakeholders, including anyone who buys apparel as a consumer, can do to make this humane anti-sweatshop model the norm. However, real gains would still be contingent on brands being willing to reform global production networks, take responsibility for factory-level conditions and recognize the desirability of paying a living wage premium to a factory for the garments they purchase. Under the current economic climate of profits before people, under a president who worships successful brands in terms of which can extort the “best deal” this seems highly unlikely. 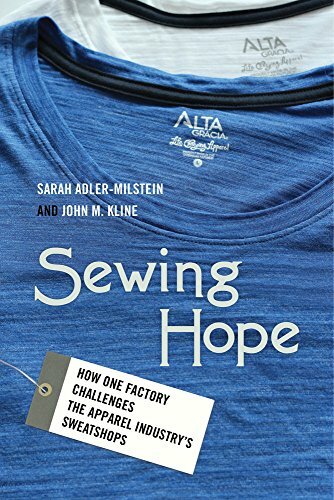 Sewing Hope is an interesting and inspiring ethnographic case study of what can be achieved when stakeholders are committed to changing lives for the better by putting social justice ahead of maximizing personal profit. Although deconstructing a wide range of economic theory about global production and supply chains, the language is accessible and even engaging through the inclusion of eloquent stakeholder voices. This is a must read for anyone concerned with escalating inequality globally and the potential of labor organizing in tandem with more humane corporate management for transforming communities. However, it is more of a case study of successful small-scale social action than a comprehensive blueprint for sustainable manufacturing on a global scale. But every small step contributes toward the difference between heaven and earth.